Action Pipe Tobacco consists of the highest quality Burley and Virginia tobacco leaves, carefully selected and blended together to give every smoker that unique smoking tobacco experience of a slow, satisfying burn that doesn’t render a harsh finish. Action is a full-bodied, high-quality tobacco that is fulfilling rich. Action Pipe Tobacco is a perfect choice for smokers who enjoy a relaxing smoke made from this premium tobacco smoked in their favorite smoking pipe. 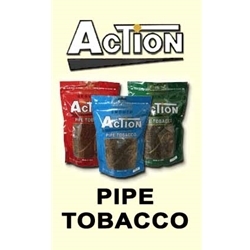 Take Action with Action Pipe Tobacco today and enjoy! Every day smokers are trading in their expensive retail brands and choosing premium tobacco instead. A great way to save money in an over-priced world. Here at Smokers Discounts we believe you should too! We’ve made it easy and affordable to buy Action Pipe tobacco online. Call us for more details!